Another good omen that bodes well for Joy’s Noise: three juvenile white-faced ibises seen at the drainage ditch nearby. The Egyptians believed that the ibis was the incarnation of Thoth, patron deity of astronomers, scribes, magicians, healers, and enchanters. Its knowledge is practical but does not preclude esoteric wisdom. 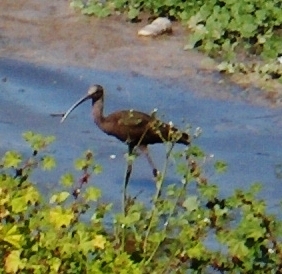 The Hebrew Bible points to the prophetic abilities of the ibis, which heralded the flooding of the Nile. Because of the shape of its bill, both birds and people were thought to use it to administer enemas, and presumably for this reason, others like the poet Ovid used the epithet ‘ibis’ as a pejorative. From Penguin Dictionary of Symbols. By joyhornergreenberg in Uncategorized on April 4, 2014 .